View map of Encamp Encamp is one of the parishes of Andorra, located on the Valira River (Catalan: Riu Valira d'Orient), and connected by a 6.2 km-long cable car to Lake Engolasters. It is also the name of the main town in the parish. Other settlements include Vila, El Pas de la Casa, Grau Roig, el Tremat, la Mosquera, and Les Bons. As of 2004, it has about 11,800 inhabitants. The center of the municipality lies 1,300 meters above sea level. The highest mountain in the parish is Pic dels Pessons (2,865 m (9,400 ft)). The historical Complex at les Bons: consisting of the Church of Sant Roma, defense tower, a water tank with an irrigation channel cut from the rock and the remains of a fortified house that correspond to the beginning of the Middle Ages. Free guided tours in July and August. Sant Roma de les Bons Church dedicated to Sant Roma, is a Romanesque building from the Lombard period. Building with guide service. 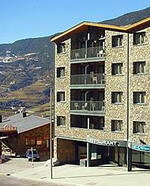 The Aparthotel Shusski is a stone-fronted residence opened in 2003 and located within 200 metres the centre of Encamp which has direct ski lift access to Pas de la Casa/Grau Roig, part of the Gran Valira Ski Area. The 28 smart, contemporary apartments all open to balconies, provide internet connections and satellite TV with DVD Players, and include fully-equipped kitchenettes. The Gran Valira Ski area has 60 lifts covering 190 kilometres of pistes of varying degrees of difficulty, and the Soldeu Resort is 13 kilometres away. Andorra's capital, La Vella, is five kilometres away and Barcelona Airport is 250 kilometres away. 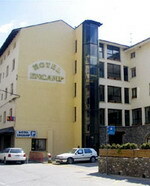 Hotel Encamp is located in Encamp in the Principality of Andorra. The funibus stop is located 10 metres from the hotel and departs for the nearest ski lift, Funicamp, one kilometre away. 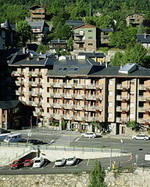 Grandvalira Ski Resort is located one kilometre from the hotel. This ski hotel is situated in Encamp under the Pyrenees mountains. All five storeys of the hotel are accessible by a panoramic lift. The hotel's buffet restaurant offers a menu of international fare. A half-board rate is available. Located one kilometre from Hotel Encamp Is Grandvalira Ski Resort, offering 193 kilometres of ski runs. The Parish of La Massana (originally "Maçana") lies in the northwest of the Principality of Andorra . La Massana is also the name of the main town of the parish. The name Massana derives from the Latin name mattianam for a variety of apple. The main industry is tourism and the parish is a major tourism destination. In winter, the main activities are skiing, snowboarding, and ski biking. The main ski resort, Vallnord, includes the Arinsal and Pal sectors, which jointly have 89 km of runs ranging in altitude from 2600 m to 1550 m. In summer, the main activities are hiking, climbing, mountain biking, 4x4 trails, and canyoning. The Abba Xalet Suites Hotel is a modern french chateau-style hotel set amid the lush greenery of the Pyrenees, one kilometre from the Pal-arsinal Ski Resort. Surf the web via the hotel's internet access facilities and enjoy discounted access to the nearby fitness centre. The Hotel Restaurant serves a range of local and international dishes, including cod-fish salad and ox sirloin, in an informal, modern dining area, and the Abba Suite Bar offers snacks, sandwiches, afternoon tea along and a range of drinks in a relaxed setting extending to a terrace area. 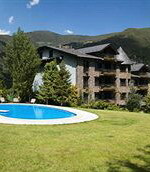 The Caldea Spa Centre, La Farga Rossell Museum, Casa Areny-plandolit Museum and Andorra's shopping district are all within 3 kilometres of the hotel. The Cortinada Pitch and Putt Golf Centre, Meritxell Cathedral and the Palau De Gel Canillo Ice- Skating Centre are within 10 kilometres. The Marco Polo Hotel is located in the Vallnord Ski Area, 200 metres from the gondola and 4 kilometres from Andorra La Vella. The hotel provides a ski-storage room and operates a ski-shuttle service. After a day on the slopes, guests can enjoy a massage or a dip in the pool, or head for the games room for a game of pool. The Marco Polo Restaurant serves a buffet of local Andorran specialities and Mediterranean and international dishes in a ski-chalet atmosphere. The Port D'envalira Viewpoint is 17 kilometres away and the old town of Bellver de Cerdanya is 29 kilometres from the hotel. Barcelona International Airport is 215 kilometres away, with an approximate driving time of 180 minutes. Sant Julià de Lòria is one of the parishes of Andorra, in the far south of that country. It is also the name of the main town of the parish. Other settlements in the parish include Bixessarri, Alixàs, Aixovall, Certers, Llumeneres, Nagol, Aixirivall, Auvinyà, Juberri, Fontaneda, and Canolich. This traditional-style hotel is located in the quiet Andorran village of Sant Julia de Lòria, just 3 km from the border with Spain. Free Wi-Fi is offered in public areas. 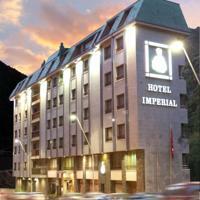 Imperial Atiram Hotel is set by the CG-1 main road to Andorra la Vella, 6 km away. It is a short drive to Caldea, Europe’s largest health spa. There are several large shopping centres within a 5-minute drive, and you can drive to Naturlandia Theme Park in 3 minutes. Private parking is possible on site, subject to reservation and at an extra cost. There is a tour desk and a ticket service and pets are accepted at the hotel. Buffet breakfast is available, and there is also a bar-café. The Imperial Atiram Hotel offers free daily press.